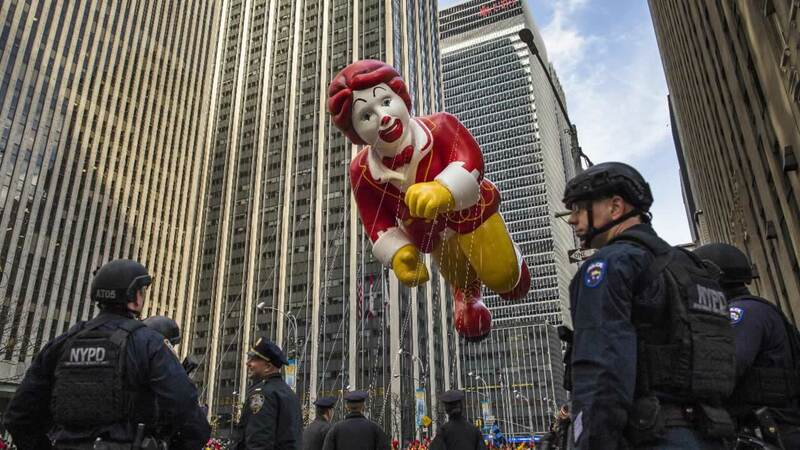 NEW YORK (KGO) -- A giant Charlie Brown balloon will join 1,000 clowns and a dozen marching bands along a parade route lined with spectators and police in plainclothes for the 90th annual Macy's Thanksgiving Day Parade. The Charlie Brown balloon is one of three new giant character inflatables in this year's parade, and joins returning favorites including Thomas the Tank Engine, Hello Kitty and SpongeBob SquarePants. The popular event draws millions of spectators as it makes its way through the streets of Manhattan before finishing up at Macy's flagship store. Among the celebrities expected to attend are Tony Bennett, Aloe Blacc, Sarah McLachlan and Olympic gold medalists Laurie Hernandez, Claressa Shields and Michelle Carter. Organizers say the opening number will include Kermit the Frog, Miss Piggy and other Muppets. But attendees also will see some somber sights, like the more than 80 sanitation trucks filled with sand that will be placed at intersections and other places as barriers against any kind of attack. There also will be a heavy police presence, including bomb-sniffing dogs and officers in uniform with assault weapons and portable radiation detectors. Officers in plainclothes will be among the crowds of people. Authorities say there is no confirmation of any credible threat and have urged spectators to come out for the parade. One prominent person who won't be in New York City is President-elect Donald Trump, who is spending the holiday at his home in Palm Beach, Florida.